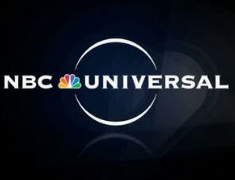 From Mediaite: NBC Universal is taking steps to control the social media use of its employees, as ten of its stations are enforcing strict guidelines on what their employees can post and share online, even on personal social media accounts not affiliated with the network. Reports Mediaite, “According to the stations’ guidelines, this includes posting opinions on newsworthy issues that have not first been cleared by a manager, re-Tweeting or sharing items, and posting news items that haven’t been verified by the station… The stations’ ombudsman, Kevin Keeshan, notes that the rules are in place because, when you work for these stations, ‘You’re a journalist. Act as if you’re a journalist. 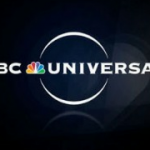 This is a vocation, not just a job.’ As such, employees are required identify themselves as NBCUniversal employees across social media platforms. Your work is your life, basically.” Read more here. From Gossip Cop: Are there ‘True Blood’ twins in the future? 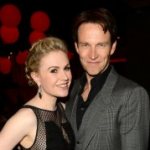 It seems to be so, as Anna Paquin and Stephen Moyer are reportedly expecting twins! As Gossip Cop confirmed in April, the “True Blood” star is pregnant. Reports Gossip Cop, “It looks like the couple’s co-starSam Tramell spilled the beans on her upcoming special delivery. ‘It’s so interesting that ‘True Blood’ has become, like, the ‘twins’ show,’ the actor, who has twins of his own with girlfriend Missy Yager, told Us Weekly. A rep for Paquin had no comment, telling Gossip Copthat the actress ‘isn’t discussing her pregnancy.’ Moyer, who wed Paquin in 2010, is already father to a young son and daughter from previous relationships.” The truth remains to be confirmed. Read more here. 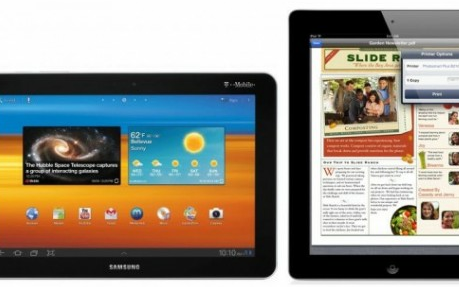 From Geekosystem: Another lawsuit filed by Apple over tablet knock-offs, this time against Samsung. And so far, Apple’s ahead. Reports Geekosystem, ” Last night, Apple won a major fight in its ongoing patent war with Samsung when a U.S. District Court Judge in California issued a preliminary injunction against the Samsung Galaxy Tab 10.1. The battle is being fought on the grounds that Samsung copied the appearance of the iPad and unfairly infringed on Apple’s design patents. When the injunction enters effect, it will block all sales and importation of the tablet in the U.S. For those unaware, Samsung and Apple have been at each other’s throats in an long-fought patent war that has spanned the globe. 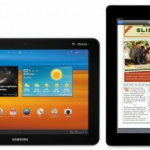 The initial salvo, fired by Apple, claimed that the Samsung Galaxy Tab 10.1 copied the appearance of the iPad and iPhone, as well the look of iOS. Apple has already won an injunction against the Galaxy Tab in the EU and Australia, and famously demonstrated how Samsung’s own lawyers could not tell the two devices apart at a 10 foot distance.” Read the full article here. 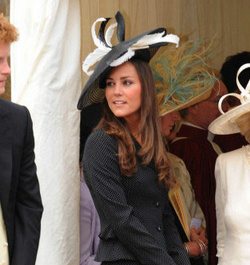 From Styleite: Would you like to own one of Kate Middleton’s rental hats? That’ll be ten thousand dollars, please. Reports Styleite, “Earlier this month, it was reported that two rental hats worn by Kate before she married Prince William would be up for bidding at Kerry Taylor‘s Passion for Fashion auction in London. The hats were estimated to sell for between $3,000 and $4,600, but the chapeaux fetched more than $10,000 total. Kate rented the toppers from the appropriately named Get Ahead Hats shop. She chose a black Philip Somerville in 2008 for the Order of the Garter… The Somerville hat was auctioned off for around $5,000, and the Aurora piece for about $5,800, the Daily Telegraph reports. Both hats went to one lucky anonymous bidder, who received rental receipts and diary entries that documented Kate’s appointments at the store. Oh, and major bragging rights.” Read more here. From SportsGrid: The Tebow/Manning Denver Broncos conversation continues. Most recently, a Colorado Public Policy poll, 53% of Coloradans would prefer Peyton Manning to be the Denver Broncos quarterback over Tim Tebow, who received 21% of the vote. Reports Sportsgrid, “Peyton’s got health issues, and he’s old. This is a reasonable split, especially when you consider the fact that not all respondents are necessarily football fans, or even Broncos fans. But when the questions got more specific, things got weird. Among Coloradans that classified themselves as “very conservative,” 53 percent preferred Tebow as the Broncos quarterback, as opposed to just 28 percent for Manning. Are you kidding me? I’m pretty sure there’s something in the Constitution about separation of football and state.” See more numbers and read about Tebow’s polarizing effect here. From The Mary Sue: You probably knew Google had some sort of crazy, intelligent brain. 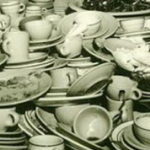 Did you know that its brain can train itself to recognize objects? 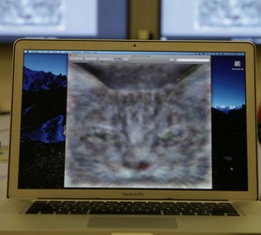 And that its trained itself to recognize cats in videos? Reports The Mary Sue, “Google’s X Laboratory, a secret facility that’s been used to research novel technologies such as self-driving cars and augmented reality glasses, has been working on creating an artificial human brain using 16,000 computer processors connected to simulate the brain’s neural networks. 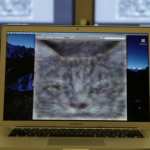 The ‘brain’ was tasked with scanning thumbnails from Youtube, after which is did the only logical thing a brain could do when presented with a wealth of human-made viral videos: identify all of the ones with cats in them. This research endeavors to explore how the decreasing cost of computing, and the ability to network thousands of processors together, can advance machine vision, speech recognition, translation, and perception, and learning systems.” Read the whole story here. 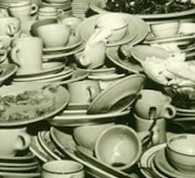 From The Jane Dough: Would you believe that men actually like to do chores? Well, you should, because it’s been proven in a recent study. This doesn’t mean, however, that they will actually do the chores. Reports The Jane Dough, “A new report shows men like to do housework. ‘Husbands and boyfriends feel guilty when they don’t do their share of the work around the home,’ the Business-Standard breathlessly reports… In other news, guys aren’t always necessarily stereotypes. Noted… ‘Contrary to expectations, men, not women, benefited from a less traditional gender role divide in household chores,’ the study said, noting that heterosexual partners living under the same roof reported a more harmonious environment when they split up the household chores equally. Imagine that. This, the study notes, flies in the face of common practice. Guys might see the long-term benefit to helping around the house, but they’re not super likely to do it on their own, the report showed.” Read more about the findings here. 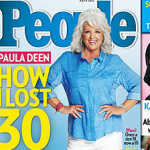 From The Braiser: Paula Deen, who’s long come under fire for her deep-fried delectables despite diabetes, has lost 30 pounds, and is now showing off her new body on the cover of People. Reports The Braiser, ” She’s sworn off the mashed potatoes, upped the amount of vegetables on her plate (although, they’re most likely still swimming in butter), and started exercising in order to shed the pounds. Oh, and she’s had help from the diabetes medication for which she’s the spokeswoman. 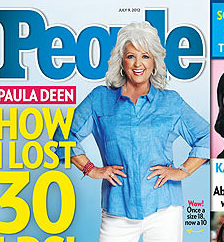 Paula says it’s taken a ‘couple of years’ of making ‘small changes’ to slim down. In that time, however, she’s continued to defend her over-the-top Southern cooking, most famously on The View, as being okay in moderation. For example, she’s cut her fried chicken consumption from monthly to weekly, and stopped drinking sweet tea. But she doesn’t feel the need to change the way she cooks, only the way she eats.” Read the story and see the picture here.